I feel like starting with Baha’is and their prayer beads. Why? Don’t know. Not the oldest religion or the oldest prayer beads. Not the newest, either. Maybe I just feel like going alphabetically. No, I think I saw a picture of a set of Baha’i prayer beads as I was web-surfing the other day and I just felt like starting there. And I’ve had enough Christian prayer beads and rosaries after six weeks of Lent. And Baha’is are a good place to start because it is an extremely inclusive religion – they have never met a major prophet they didn’t like. So, what is the Baha’i faith? It was founded about 150 years ago in the land that was once called Persia and is now known as Iran. Like many religions, it was founded by someone who had an extreme mystical experience that forever changed his life. The founder of the Baha’i faith was a Persian nobleman named Bahá’u’lláh. Bahá’u’lláh claimed to be a messenger of God, a continuation of – not a repudiation of – the line of God’s prophets that began with Abraham (Judaism) and continued through Muhammad (Islam). His main message was that there is only one God and that all the other prophets and their followers were all of His children who should be united in their love for Him and for each other. I often think of the Baha’i faith as the ultimate feel-good religion (and I mean that as a very good thing). Who are the Baha’is? Relatively speaking, their numbers are small. Adherents. com lists 7.6 million worldwide, with perhaps 700,000 in the U.S. But their blanket is quite wide, with Baha’is today coming from more than 2,100 different ethnic and tribal groups, according to Baha’i International. The majority of Baha’is live in Iran, where many are persecuted for their faith. It hath been ordained that every believer in God, the Lord of Judgement, shall, each day, having washed his hands and then his face, seat himself and, turning unto God, repeat “Alláh-u-Abhá” ninety-five times. Such was the decree of the Maker of the Heavens when, with majesty and power, he established Himself upon the thrones of His Names. Some industrious Baha’i invented prayer beads that would aid in keeping track of the 95 repetitions of God’s name. One set is a circle of 95 beads, with the first 19 either separated from or different from the rest. The second type is usually a strand, rather than a circlet, with three parts – a line of 5 beads, a transition bead, and a line of 19 beads. The strand is often finished with a tassel, called a “siyyid,” and the nine-point star that is the symbol of the Baha’i faith. 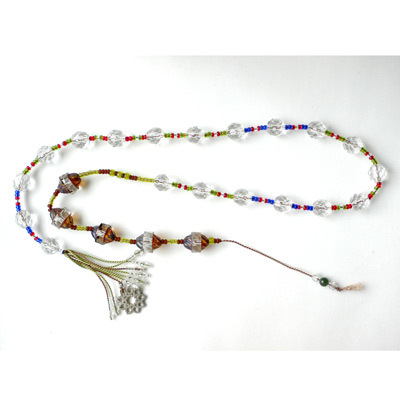 The website 95 Prayers suggests the devotee sit with the 19 beads in his or her dominant hand and the 5 beads in the other hand. At each repetition of “Allah-u-Abha,” the fingers move down the strand of 19 until it hits the tassel. Then, the fingers of the non-dominant hand move down one bead on the line of 5, and the process is begun again. 5×19=95. In a forthcoming entry, we’ll talk with a Baha’i about their use of prayer beads. Until then . . . happy beading and praying. I don’t know Sarah “mawkinberd” of Ruston, La, but if any of you do, please give her a big kiss for me! Here’s her review. Holy Moley!!!! LBRLucas of San Diego gave Bead One, Pray Too a five-star review on amazon.com, in the book’s first amazon customer review. I am just overwhelmed at her reaction to the book. Thank you so much Louise!!! I was so surprised today when my subscription to Andrea Useem’s wide-ranging and thorough religion blog, Religionwriter.com, came into my mailbox today and right there in the first sentence I saw my name, a link to this blog and my website. Thank you, Andrea! It’s two days after Easter and I assume many of us are coming down off our sugar hangover. I know I am. 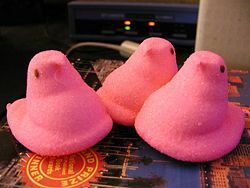 I had four Peeps (I LOVE THEM) , two pieces of cake and four cookies in the 36 hours between Good Friday night and Easter morning. Gack. No wonder my jeans don’t fit. Now that the Easter season is behind us, I want to branch out in th next weeks’ posts and explore prayer beads beyond the Christian tradition. I think we’ll start with Baha’i prayer beads. Stay tuned . . . .
Saturday night I attended the Easter Vigil service at St. Jerome’s Catholic Church in El Cerrito, Calif. to see my friend Carolyn become a Catholic. Carolyn, who is in her sixties (I hope she won’t mind my saying that!) decided sometime in the last year that she wanted to become a member of the church she had been attending for quite some time and she began what Catholics call the “Rite of Christian Initiation for Adults,” or RCIA. The evening began with a bonfire in the church’s courtyard. The priest lit the paschal candle from the bonfire and then we proceeded in silence into the darkened church. We all had candles and the priest passed down the center aisle with the paschal candle and we all lit our small candles from it. After some beautiful music, several readings and the homily, the priest introduced Carolyn as the night’s only catechumen and invited her forward with her sponsor. Together, they walked to the baptismal, which a deacon began filling with holy water as the congregation sang. Then, after repeating her statement of faith, Carolyn was baptized, bowing her head over the baptismal bowl as the priest pourd water from a pitcher over her head: “In the name of the Father” (little douse of water), “In the name of the Son” (trickle of water), “and the Holy Spirit” (FLOOD of water!). Carolyn came up, flashed her 1000-watt grin and raised two clenched fists in the air in victory. A few minutes later, she was confirmed, taking the name Martha, for both her mother and the saint. And a few minutes after that, she took her first communion – three church sacraments in one night. Now, what does all this have to do with prayer beads? Well, I am not a Catholic and much of the service was indecipherable to me. Also, as I am not a Catholic, I am not welcome to take communion in their church. 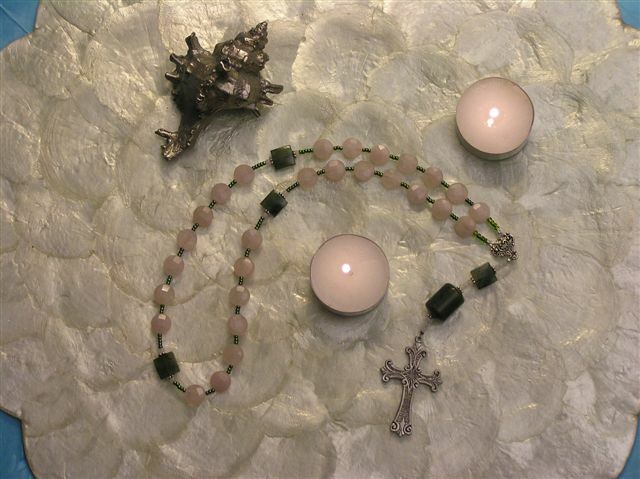 So I brought along my prayer beads – a Protestant rosary of rose quartz and jade (pictured above) – and when the congregation engaged in a call and response section I could not follow, and when they went for communion, I brought out my beads, sat quietly with them in my lap, and said some prayers. Some I took from a phrase in the prayers going on about me: “Christ has died, Christ has risen, Christ will come again” on the weeks beads. At other times, I said the 23rd Psalm on the same beads. At other times, I just breathed in and out on each bead that universal cry of the divine: “I am. I am. I am.” It kept me connected to a 2-1/2 hour service that wasn’t, shall we say, in my usual language. I was so honored to be invited to Carolyn’s service. There are seven sacraments in the Catholic Church and Carolyn experience three of them in one night. It was a big deal. To those of us for whom the Christian rituals have meaning, it is a truly special moment when you see someone you love and admire take the body and blood of Christ for the first time. And I brought Carolyn a gift – a certificate wrapped in a box and tied with a bow promising her I would make her a Catholic rosary with beads of her choice. We hope to go shopping together later this week – I am sure I’ll make another blog entry on it. How I would love to go and sit in a church or other place of sanctuary and meditation today and work my prayer beads. Good Friday has always been one of my favorite days in the church calendar. Is that weird? It is such a somber day. I think it is among my favorites because when I was a child New York’s channel 11 used to run some movie – maybe “King of Kings” – every Good Friday and the scene on the cross was so dramatic. Whatever movie it was, I particularly remember the part where when Jesus died, the skies darkened and huge storm clouds rolled in and there was all this thunder and lightning. The drama of it just got me. And I guess I knew about death as a kid – I had lost my great-grandmother and two great-aunts – and I could grasp the idea that Jesus died. So on this day I usually slip into a church – any denomination will do, as I feel all people of faith are family – and I sit in a pew and look at the cross and think about the day and what it must have been like. I also usually open the Bible and read the section about the crucifixion in one of the Gospels. But today I am sick. Sick, sick, sick. I have the creeping crud that has hit everyone hard this year and, the doc said, a touch of pneumonia. So I am not going anywhere. Instead, I will say the following prayers, drawn from the Good Friday section of Phyllis Tickle‘s remarkable “The Divine Hours: Prayers for Springtime” which is just about essential for anyone who wants to practice personal prayer at Eastertide. Because today is all about the cross and the crucifixion, I will use my Catholic rosary today. If you are using another form, simply pick and choose the prayers below that fit your beads. For God alone my soul in silence waits; from him comes my salvation. 1. I am poured out like water . . . my heart within my breast is like melting wax. 2. My mouth is dried out like a potshard . . . and you have laid me in the dust of the grave. 3. Packs of dogs close me in, and gangs of evildoers circle around me . . .
4. They pierce my hands and my feet; I can count all my bones. 5. They divide my garments among them; they cast lots for my clothing. 7. Save me from the sword, hasten to help me. 9. I have been entrusted to you ever since I was born; you were my God when I was still in my mother’s womb. Almighty and everlasting God, who willed that our Savior should take our flesh and suffer death upon the Cross, that all mankind should follow the example of His great humility, mercifully grant that I may both follow the example of His patience and also be made a partaker of His resurrection. Through the same Jesus Christ. Amen. It’s Maundy Thursday. I had planned a whole week of special Holy Week prayers for prayer beads. But I am down with the creeping crud that seems to have hold of most of the SF Bay Area. I went to the doc yesterday and she said I have the beginnings of pneumonia in the lower lobe of my left lung (say that three times fast) and has put me on bedrest and lots of fluids. There have been times this week when I swear to you if the next big quake finally hit us, I could not have moved one inch or cared one jot. I have felt so bad I have actually resorted to drinking hot tea – ICK – or, as I liked to think of it as a child, “cigarette water.” So I have had to curtail my plans. Tomorrow is Good Friday – one of my favorite days of the year (is that weird?) – and I promise to post a special set of prayers for the day. Until then – cough, cough, ack, ack.